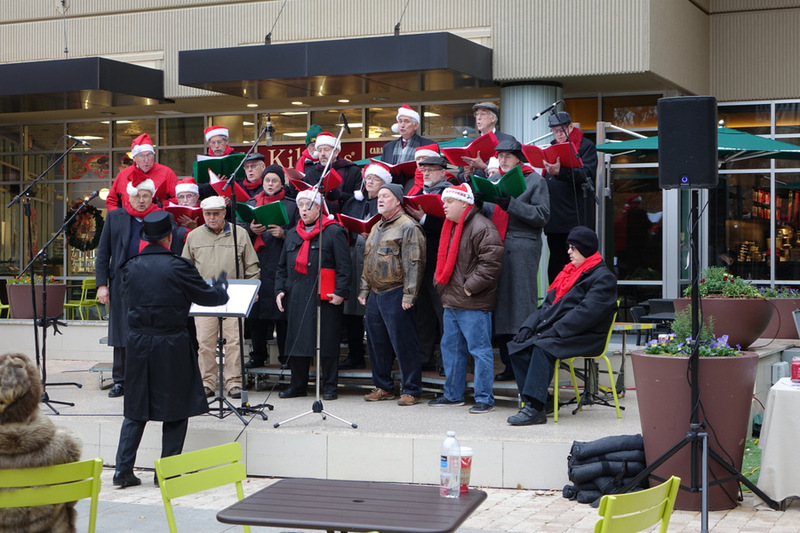 Last weekend in downtown featured Holiday Happening, where a number of traditional, regional, and modern events celebrated Christmas and the holidays such as the Palmetto Statesmen above. Santa gives some last minute instructions to be good as he prepares to drive his sleigh. TNT Lights in Mauldin / 106 Shearbrook Drive is a house decorated with more than 325,000 Christmas lights. The free exhibit is opened nightly through New Year’s day. The yard is open to walk through, and every section opens up a new theme. There are some special events such as Santa and face painting. One path is lit by simulated candy. The Left Lane bluegrass band performs Christmas music in NOMA Square over the weekend as part of the Holiday Happening festival. Although most of the event locations had portable fire pits such as this one, the weather was warm enough that they weren’t necessary, although they added some ambiance at night. Not ‘Dressed up like Eskimos’! Last weekend was a festival of Holiday Happening, which included entertainment such as the band shown here in the Tate Plaza at Falls park. It was unseasonably warm over the weekend, and the singer was singing the phrase ‘Dressed up like Eskimos’ at just about the time this photo was taken. Being comfortable in short sleeves was very un-Eskimo like this weekend. The Greenville Griswold is a fantastic free Christmas light show synchronized to music. It consists of more than 200,000 lights separated by 560 Light-O-Rama control channels. The music is broadcast on speakers, as well as a low power radio station so that it can be viewed from the comfort of a car. Foot traffic is also allowed with parking at Faith Baptist church (except for Wednesday and Sunday nights). Watch them compete in “The Great Christmas Light Fight” tomorrow (Monday) on ABC at 8pm! For more helpful details about viewing this show on Ridgewood Drive in Greenville, see the information post on Facebook. The “Greenville Griswold” Christmas Light Display. Located on 11 Ridgewood Drive, the house features 480,000 lights synchronized to music. Open nightly until 10:30 through the Christmas season.